MOSCOW (Sputnik) - The Iranian Foreign Ministry has refuted the statements made by Morocco on cooperation between the Iranian Embassy in Algeria and the Western Sahara independence movement Polisario Front, according to the ministry's statement. On May 1, Moroccan Foreign Minister Nasser Bourita threatened to cut diplomatic ties with Iran over what he considered Tehran's military support of the Polisario Front via the Hezbollah movement. According to media reports, Morocco blamed the Iranian Embassy in Algeria for having ties to the Polisario. The Embassy has reportedly refuted the claims. "The statement on collusion between the embassy of Iran and the Polisario Front is false," the Iranian Foreign Ministry's spokesman Bahram Qassemi said. Qassemi noted that the two states' diplomats had discussed this issue. He stressed that Iran recognized the right of any state for security and non-interference in its internal affairs. Meanwhile, Bachir Mustapha Sayed, the state councilor of Polisario, told Sputnik that Morocco's allegations against Iran and the Hezbollah movement were false, adding that Rabat had no evidence to substantiate such claims. READ MORE: What's Really Behind Morocco's Decision to Cut Ties With Iran? From 1884 until 1973, the area of Western Sahara was a Spanish colony, when administrative control of the territory was given to Morocco and Mauritania. 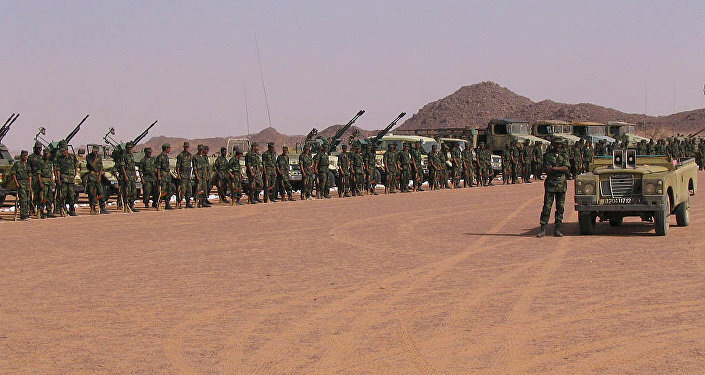 Since 1973, the Polisario Front rebel movement has been engaged in fighting, first against the Spanish colonial forces, and then against Morocco. In 1976, the Polisario Front declared the establishment of the Sahrawi Arab Democratic Republic, which was not allowed into the United Nations, but won limited recognition by a number of states. The fighting ended with signing a ceasefire in September 1991. The UN-brokered truce stipulated an independence referendum, which has never taken place. Tensions Flare After Netanyahu's Theatrics: War With Iran on Horizon?